I must admit, I am relatively new to the whole meat thing. Thanks to a particularly traumatizing petting zoo experience in the summer of 1989, I’ve been predominantly vegetarian for the last twenty years. Then, a few months ago it occurred to me that I wasn’t abstaining from meat for moral, ethical or spiritual reasons—I was mostly just being stubborn. So I’ve started slowly reincorporating it…and discovering the awesomeness I’ve been missing out on for the past 2 decades. Obviously, veggie, chicken, or turkey burgers would all be tasty with the same treatment. Regardless of your burger choice, serve these with sweet potato fries. 4 slices pepper jack cheese $3 for 8 oz. Prepare grill or grill pan, over medium-high heat. If using grill pan, drizzle lightly with olive oil. Start by caramelizing the onions: heat olive oil over medium heat in a frying pan. Add onion slices and cook for 10-12 minutes or until soft. Combine beef, garlic, diced onion, jalapeno and liberal amounts of salt and pepper. Form into 4 patties. Cook to desired done-ness (evidently I like medium-rare). Top each burger with a slice of pepper jack and, if cooking inside, place under a broiler or even in a toaster oven until just melted. If you're grilling outside, just cover the burger and cheese with the grill cover for a minute or two until the cheese melts. 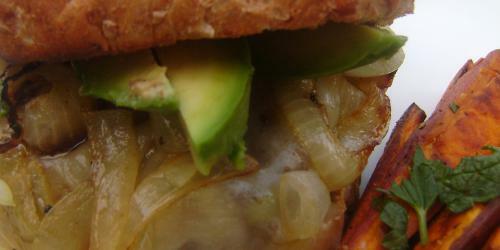 Toast or grill the buns and top each bun bottom with a cheeseburger, some caramelized onions, and a few avocado slices. Serve hot.